This simple, cooling salad is a perfect dish to compliment spicy, flavorful Chinese cuisine. 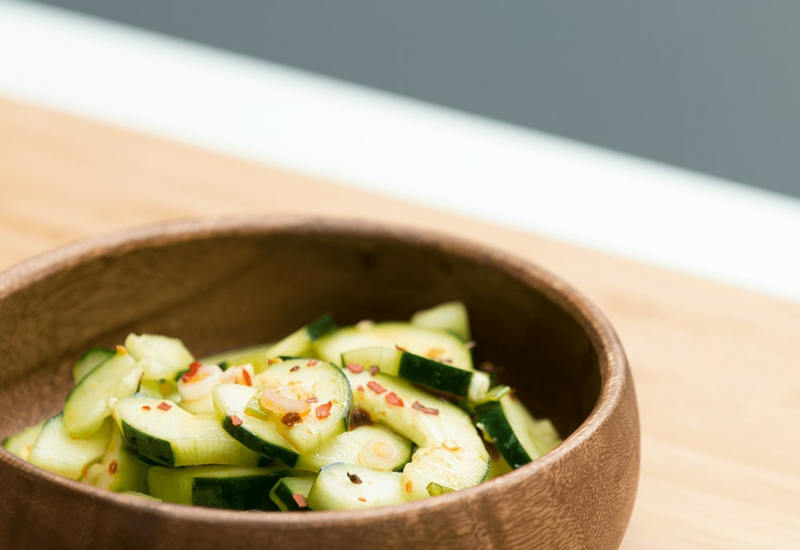 Cucumber slices are dressed with a mixture of green onions, rice vinegar, ginger and sesame oil for a side that's super tasty but still light and fresh. The rice vinegar adds a refreshing acidity and helps crisp the vegetables, while chili oil adds a bit of heat. Vegan, gluten-free and Whole-30 friendly, this dish also extremely healthy. Best of all, it's ready in under 10 minutes, so you can assemble the entire salad while your other dishes are cooking. Make this salad shortly before serving to ensure the cucumbers don't water down the dressing. To leech some water out of the cucumbers before serving, toss the cucumber slices in a pinch of salt. Place in a strainer and let sit for 30 minutes. Dress as directed. Per Serving: 92 calories; 5g fat; 12.5g carbohydrates; 1g protein; 0mg cholesterol; 534mg sodium. I'm a Southerner so pickling things is in my blood. This is a really cool Asian-inspired riff on the pickled cucumbers that I grew up on in the summertime in North Carolina. They call this a salad, I call it Pickled Asian Cucumbers - either way, it's absolutely delicious. Love this fresh, non- caloric receipe. I add fresh chives which lifted the flavor even more. I love this recipe. It's an easy and quick and delicious side salad. It literally took me five minutes to make, and none was left. I always love this side that you get at Korean BBQ spots, so quick and easy to make. I like to add a touch more ginger since i'm all about that ginger cucumber combo - I think I found my new go-to. The dressing for this delicious salad is very similar to something I get at my favorite Chinese restaurant. I've prepared this with excellent results. For this one, I used Schezuan pepper corns and sweetened it with a bit of mirin. In deference to my husband (who detests ginger) I left it out. My 2 year old who eats nothing LOVED this recipe. I absolutely love it. I added a lil fish oil as well and what an amazing flavor. Simple and easy to make! !